If a workflow template has been bound to a user or group, then before they can access objects or actions they will need to request Access and ultimately receive approval. When approved, the requested access or action will become available for the requested time period. 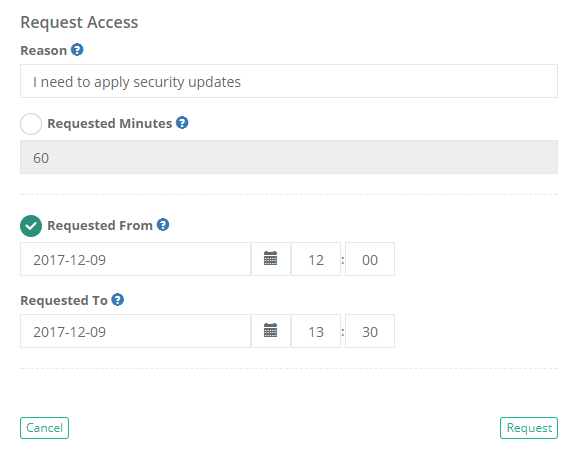 If rejected, the requested access or action will not become available and the user will need to make the request again. Click the Request button for the access or action that you would like to request. Reason: Enter a brief reason for why you are requesting access to this Action. This reason will be sent to the Approver(s) for their consideration. Choose between Requested Minutes and Requested From by selecting the appropriate radio button. Requested Minutes: Enter any value greater than 0. The minutes will indicate the amount of time this Action is available to you beginning from the time that the approval workflow is completed as Approved. When the time expires, the action will revert back to requiring a Request. Requested From / To: Enter or select using the Calendar button, a Requested From value and a Request To value in the future. This will indicate the date range where this Action will be available to you after the approval workflow is completed as Approved. When the time expires, the action will revert back to requiring a Request. A confirmation dialog will appear alerting you that the request has been submitted. Click OK to confirm the message. The Request button will now update to let you know that the Action has been Requested. To see the current status of your request, you may click this Requested button or navigate to Management > My Workflows > My Requests.